All of our couriers have now been to collect our customers' parcels that are out for next-day delivery, so that you have them in time for Christmas. 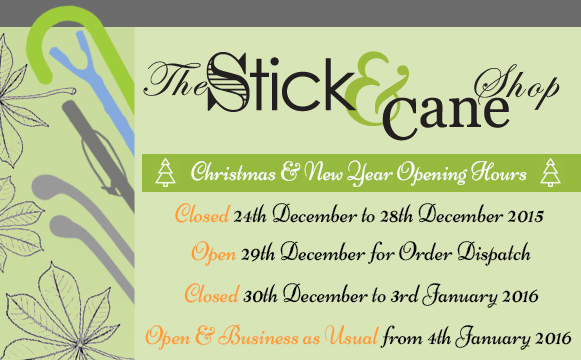 It has certainly been a busy season at the Stick & Cane Shop this year. Our country hiking staves have certainly been very popular this season, so we hope the recipients love whatever stick you bought as a gift this year! Also, whether you are a new or return customer, we hope you have a wonderful festive period! We will be closed from 24th December until 28th, but we open one day between Christmas & New Year on the 29th December to dispatch any orders that have been placed and answer any calls/emails you may have sent. We then close again from the 30th December until the 3rd of January 2016 for our New Year break. We will then be back open and bright eyed and bushy-tailed ready for the year ahead on 4th of January. So however you may be spending the next couple of weeks, we wish you a merry Christmas and all the best for 2016!